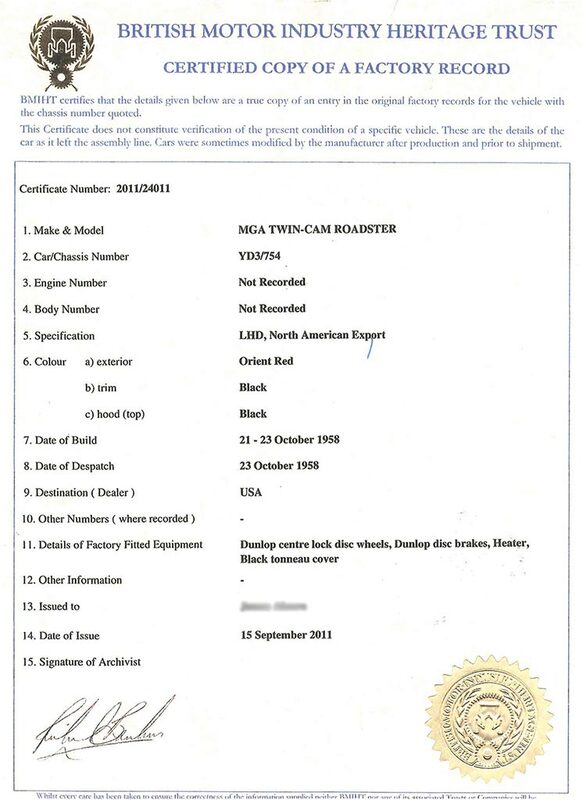 According to its accompanying British Motor Industry Heritage Trust Certificate, this 1959 MGA Twin-Cam Roadster is an original left-hand-drive export model completed during late October 1958, and titled as a 1959 car. Factory equipment included Dunlop center-lock disc wheels; Dunlop four-wheel disc brakes; a heater; and black tonneau cover, with the MGA finished in Orient Red with black upholstery, the colors it displays today. In 2012, this rare MG was given a complete restoration by Twin-Cam specialist Jim Alcorn’s Auto Vintagery of La Jolla, California. Less than 500 miles have been traveled since completion of the work, and the Twin-Cam has enjoyed fastidious care and proper storage. Complete with books, tools, and a tonneau cover, this rare and charismatic MGA Twin-Cam is a versatile British sports car that can be enjoyed on the show lawn and the open road. Inspired by George Phillips’ MG TD-based 1951 Le Mans special and refined by Sydney Enever and his design team, the MGA debuted in September 1955 as a radical departure for MG. 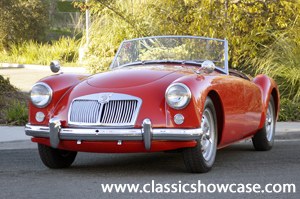 Successful experiments with a supercharged twin-cam engine and the desire for a competition-oriented model spurred development of the MGA Twin-Cam, released for sale in early 1958. A significant performance leap, the 1,600 cc twin-cam engine delivered top speeds in excess of 110 mph, matched by improved gearbox ratios, a higher final drive, Dunlop four-wheel disc brakes, and strong yet lightweight disc-type “knock-off” wheels. Only 2,111 Twin-Cam MGA’s were built through early 1960, and the model remains one of the most coveted and satisfying British sports cars produced.